Phoenix has dropped 13 straight games coming into today, and it doesn’t seem that they will snap out of it anytime soon. Despite having the #1 overall pick from last year, they may be in the running to get the pick once more. Sacramento, on the other hand, has been playing well of late, winners of four out of their last five. They are in a direct battle with both of their LA rivals, the Clippers & Lakers for the #8 spot in the conference. They are the #24 scoring team in the country, and nearly last in points allowed. They don’t lack guys who can make plays, like Devin Booker, Ayton, Josh Jackson, and Kelly Oubre. Jamal Crawford has a good game every now and then. And they finally have a real starting point guard in Tyler Johnson. But Booker has constantly been going in and out of the lineup, while it has been weeks since TJ Warren has last appeared in a game. The season overall has to be looked at a disaster, as they are not convincing their star to want to be here, despite signing a max extension. Phoenix will have their hands full tonight, and it’s hard to say exactly what they can do to slow the Kings down. Defense hasn’t been their calling card, and It’s also been quite a while since they picked up their last victory. Can tonight be the night they end their skid? Can pigs fly? Is Ice Cream a breakfast food? The answer to all three questions is no. So far so good for this team, which is overachieving in 2018-19, as the young core came together rather quickly after yet another losing season last year. Buddy Hield is shooting the three as well as anybody in the league. De’Aaron Fox’s ability to make plays has been something to marvel at, just like his quickness. 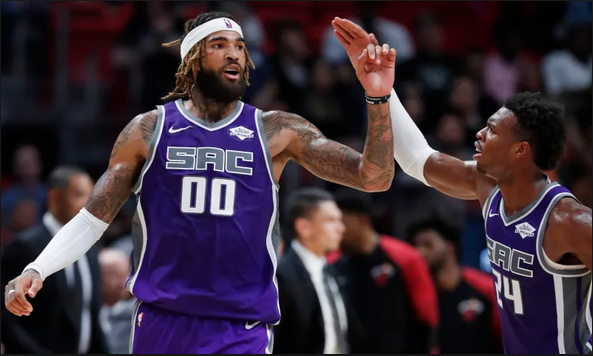 Marvin Bagley III and Harry Giles have both been playing terrific ball for the Kings over the past month. Now they add Alec Burks to the mix, as another playmaker joins them off the bench. Harrison Barnes‘ addition should also serve to improve the offense. They just have to keep it going, and it seems very doable. In any year past, it would be hard to feign confidence in the Kings, but this time it’s all genuine. They have a serious chance to get to the postseason, and even if they draw the Warriors, it could be a learning experience. After saving the franchise from moving to Seattle, owner Vivek Ranadive should expect nothing less from the Kings. Another W coming for SAC-Town! Bogdan Bogdanovic will have a big game off the bench, while Harrison Barnes will add 25 in just his second game as a King! Booker or not, it won’t help the Suns on this night.